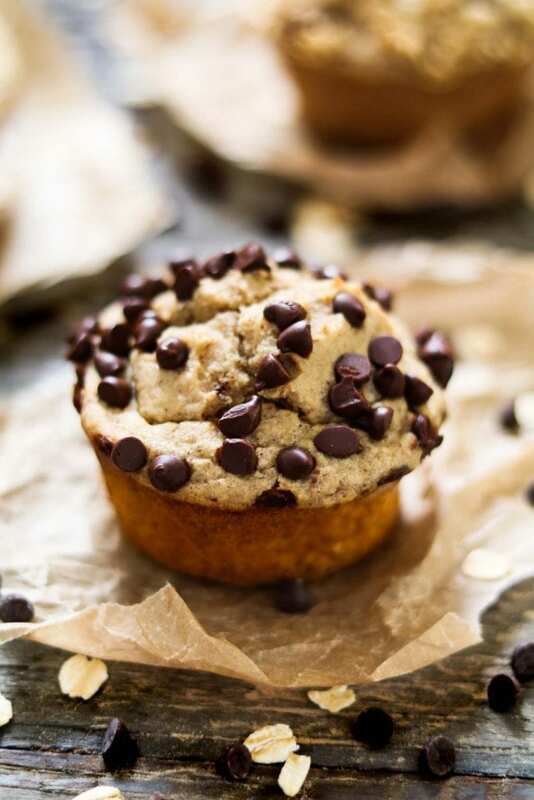 These Vegan Protein Muffins (blender muffins) are quick, easy, healthy, and delicious! All you’ll need is some common ingredients, a blender, muffin tin and your oven. Now that my son is on summer break, it’s time to adjust my schedule and create a balance between work and activities for him. He’s not one for sitting still too long, so I try to get him out of the house often, so he doesn’t go bonkers. This helps keep me sane, too. I can’t say I’m very organized with activity scheduling, but I definitely have it down in the grab-and-go snack department. We are usually running out the door last-minute, and portable snacks always make life easier. These Vegan Protein Muffins fit into our summertime madness very well. Not sure what it is about summer, but my little one sure likes to eat, and he’s a total snack monster. He could seriously eat all day long. I don’t mind giving him extra snacks because it makes him happy. I just make sure the snacks are nutritious, he’s active and he eats his regular meals. 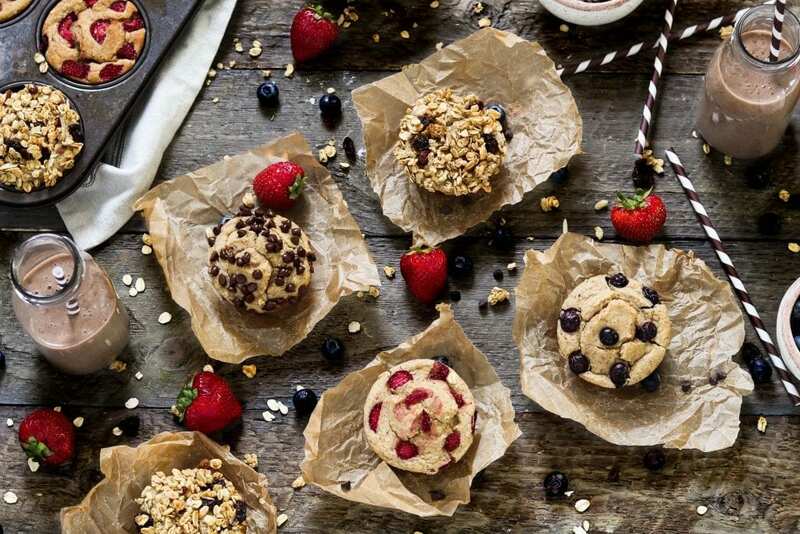 Some of his favorite snacks are Smoothies, Dates with Peanut Butter, No-Bake Granola Bars, Fruit, Pretzels, Almond Joy Energy Bites, and these Vegan Protein Muffins (which are his latest obsession). I couldn’t wait to try Bob’s Red Mill Protein Powder Nutritional Booster. I already use a ton of their pantry items, and I’ve bought them for many years. Their products are high-quality, and I’ve never had any issues. I was excited to try out their protein powder because I still haven’t found one that I liked. A lot of powders have a chalky texture, and sometimes a weird flavor. Plus, a lot of them have stevia in them, and I’m not a fan of the aftertaste. I was happy to see that the Bob’s Red Mill version is sweetened with Monk Fruit. Yay! Bob’s Red Mill was so kind to send out a package containing three different flavors of protein powder: Vanilla, Chocolate, and Chai. My biggest dilemma was which to try first. I had a bunch of baked recipes in mind to make, but I wanted to give these powders the smoothie test first. I had my mini taste tester on the job too. I opened the Chai flavor first and it smelled heavenly. I couldn’t put it down, so it was first in line. I blended 1 cup of almond milk, 1/2 of a frozen banana, a few ice cubes and the chai powder. I wanted to keep it simple, so I could really taste the product. Well, my mind was blown! The smoothie was so creamy without a hint of chalkiness. The Chai flavor was on point and there wasn’t an aftertaste. I made the Chocolate and Vanilla smoothies the same way, and I was equally as impressed. The texture is smooth and blends perfectly. I really like the subtle sweetness of the Monk Fruit, too. My son tasted all three flavors and decided that chocolate was his favorite. I was totally sold at this point because my kiddo doesn’t usually like protein powder. 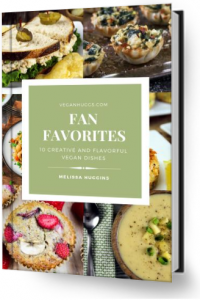 Now I can make his favorite Vegan Chunky Monkey Smoothie Bowl with a dose of extra protein and fiber. 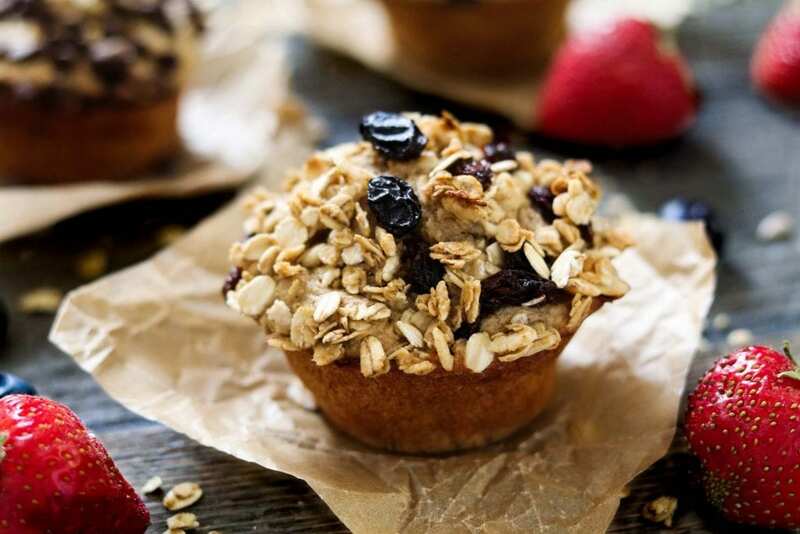 I love making muffins for my family, especially healthy ones. They are a cinch to make and will keep us fueled until our next meal. They help avoid bad hunger choices too. I’m also a big fan of quick clean up, and these muffins are perfect for that. The ingredients get tossed into a blender and poured straight into a muffin tin. No bowl…no whisk…no mess. Just bake and enjoy! The ingredients are simple, and you probably have most of them in your kitchen already. You’ll need rolled oats, non-dairy yogurt, ripe bananas, ground flax, maple syrup, vanilla extract, baking powder, baking soda, sea salt, your favorite toppings and Bob’s Red Mill Protein Powder Nutritional Booster (*coupon below). 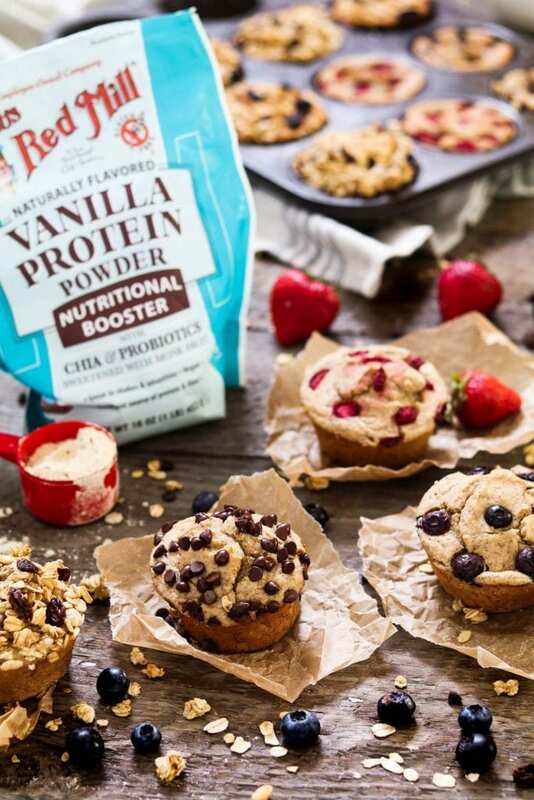 Not only are these muffins nutritious and delicious, but they’re also gluten-free, oil-free and of course, vegan! So, if you’ve never had blender muffins, you might want to give them a shot. They are slightly denser than your average bakery muffin but completely moist and delicious. I’ve made blender muffins many times before, but this was the first time I tried them with protein powder. I was worried they might be a little dry, but they came out perfect. I just added a bit more dairy-free yogurt than usual. I used Bob’s Red Mill Vanilla Protein Powder for this recipe, but their other flavors will work perfectly too. I’m thinking of making Chai Pumpkin muffins next. So, if you’d like to add some extra protein and nutrition into your life, you might want to pick up a bag of Bob’s Red Mill Nutritional Booster. I’m completely satisfied with this product, and I highly recommend it. If you make these Vegan Protein Muffins, I’d love to hear what you think. It would really make my day. You can also follow me on Instagram and share your creation with me. Just tag me @veganhuggs and hashtag #veganhuggs so I don’t miss it. Pour mixture into each slot about 3/4 of the way full. Sprinkle each one with your favorite toppings (*Don't press the toppings into the batter. I feel like it yields a flatter muffin this way). Bake for 15-18 minutes, until lightly golden brown. Insert a toothpick in the middle of a muffin or two. If it comes out mostly clean, they are done. Let muffins cool for 10 minutes in the pan before transferring them to a cooling rack, then cool for another 10-15 minutes. The muffins might flatten out a little bit...it's normal. 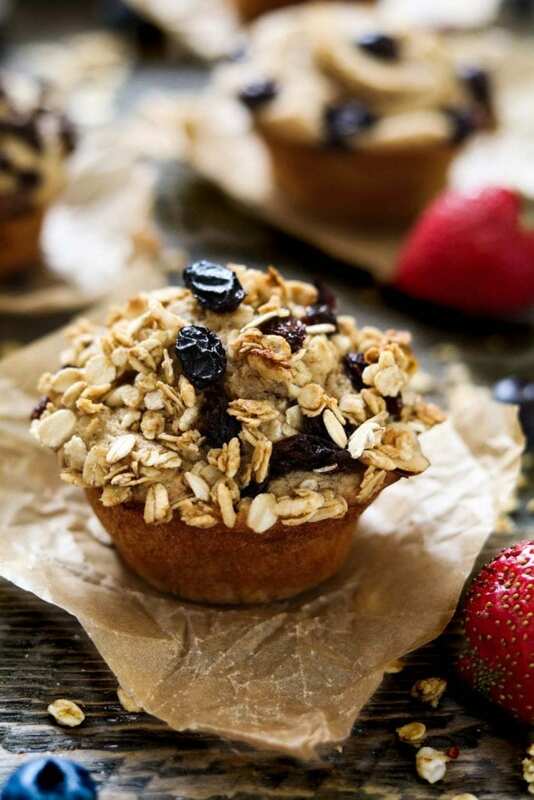 *To avoid the liner sticking to the muffin, let them completely cool before enjoying. If not using liners, gently pop out each muffin with a butter knife. * Topping Ideas: Berries, granola, vegan chocolate chips, chopped nuts, seeds, dried fruit, rolled oats, crushed cookies. * This recipe makes about 10-11 muffins, depending how much you fill the slots. If you've greased a slot that won't be used, just add a small amount of water to it, or wipe out the oil to prevent smoking. * Some muffin liners have a tendency to stick. If you aren't sure about them, just lightly grease the inside to prevent an unhappy muffin experience. * If you don't have ground flaxseed, you can use chia seeds instead. The measurements and method are the same as the flax, except the chia seeds can be used whole. If you only have whole flaxseed, you can grind it in a coffee grinder. * My favorite topping for this recipe was the granola. For some reason it yielded a puffier muffin top. I used two different brands and it had the same results. All the toppings were equally delicious though... the granola just looked the fanciest. Hi Melissa, will these work with a different vanilla vegan protein powder? I use garden of life and always have it on hand as opposed to trying to find the Bob’s one. Thank you for your time! These muffins fabulous and exactly what I am looking for when school rolls around and the 5am alarm will be set again. Is is possible to add the chocolate chips and nuts to the batter after it has already been blended? For grab and go I always end up making a mess when the ingredients are on top. 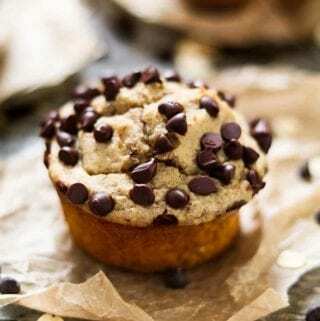 Any recommendations on how to make the muffins with a higher protein content? If I add an extra serving or 2 of the protein will the mixture be too dry? Maybe add some extra water if so how much water do you think? Thanks for your help! Is it possible to freeze them? I’d like to make a bunch of them, and take them out the day before to always have a proteinrich snack to go. Btw the recipe sounds amazing! This sounds so very yummy and I can’t wait to make some. I do have a challenge with one ingredient, Maple syrup, as I have diet restrictions, sugar of any kind being a big no-no. I have replaced all things sugar with powdered Stevia. If I replace the Maple syrup with powdered Stevia, this will change the consistency a bit. Do you think it will too much of a significant change or not a problem? So easy and they taste amazing! Thank youuuuu! I’m new to protein powders and was wondering if you have advice on what to use here in Ireland? I see BOb’s Red Mill don’t deliver, but I have no idea on what to look for in a decent one! Love your recipes! Thanks! These muffins look amazing!! We absolutely love Bob’s products, and appreciate you letting us know about the protein powder. We don’t have kids right now, but frequently go on hikes and these would be PERFECT before, during or after! Thanks for the recipe, will try soon! Oh, my kids will love this! 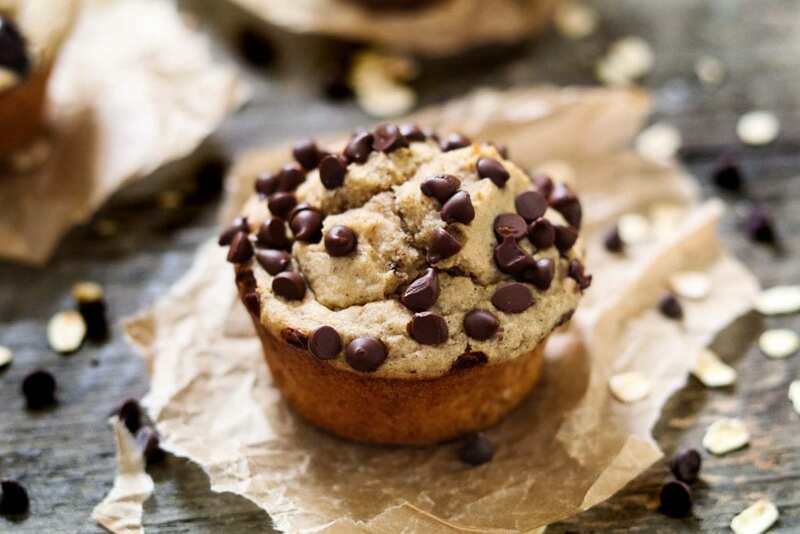 🙂 Thank you for this great recipe, one can never have to many healthy, vegan muffin recipes!